This is exactly how the first 15 picks of the upcoming draft will play out. 1. Cleveland Browns: Sam Darnold, QB, USC. Analysis: After signing Carlos Hyde, the Browns don’t need a running back. And they can’t afford to pass on a top quarterback for the third year in a row. 2. New York Giants: Saquon Barkley, RB Penn State. Analysis: Barkley and Odell Beckham Jr. will form the best running-back-wide-receiver duo in the NFL, and make life easy for any quarterback the Giants have — Eli Manning, or someone else down the line. 3. New York Jets: Josh Rosen, QB, UCLA. Analysis: The Jets traded up to take the best quarterback available. TRADE: Buffalo sends two first-round picks this year plus their first-round pick next year to Cleveland in exchange for the fourth pick this year. 4. Buffalo Bills: Josh Allen, QB, Wyoming. Analysis: If he isn’t ready to play right away, Allen can sit on the bench and develop behind starter A.J. McCarron. 5. Denver Broncos: Quenton Nelson, G, Notre Dame. Analysis: Elway passes on Baker Mayfield and improves the Broncos offensive line, which stinks. 6. Indianapolis Colts: Bradley Chubb, DE, North Carolina St. Analysis: The Colts best pass rusher, Jabaal Sheard, had just 5.5 sacks last season. 7. Tampa Bay Buccaneers: Derwin James, S, Florida St. Analysis: The Bucs need a safety. 8. Chicago Bears: Tremaine Edmunds, LB, Virginia Tech. Analysis: Edmunds replaces Christian Jones, who signed with the Detroit Lions. TRADE: Green Bay sends a first-round pick, a third-round pick and a fourth-round pick to San Francisco in exchange for the ninth pick. 9. Green Bay Packers: Minkah Fitzpatrick, CB/S, Alabama. Analysis: Fitzpatrick replaces Demarious Randall, whom the Packers traded to the Browns. 10. Oakland Raiders: Denzel Ward, CB, Ohio State. Analysis: Ward joins the Ohio State connection in the Raiders secondary with cornerback Gareon Conley. 11. Miami Dolphins: Roquan Smith, LB, Georgia. Analysis: Smith will replace veteran linebacker Lawrence Timmons. 12. Cleveland Browns (from Buffalo): Marcus Davenport, DE, UTSA. Analysis: The Browns need a defensive end to take pressure off last year’s first-round-pick defensive end, Myles Garrett. 13. Washington Redskins: Vita Vea, DT, Washington. Analysis: The Redskins run defense was abysmal last season. 14. San Francisco 49ers: Isaiah Wynn, G, Georgia. Analysis: The 49ers have to protect Jimmy Garoppolo. Wynn can play any position on the offensive line. 15. 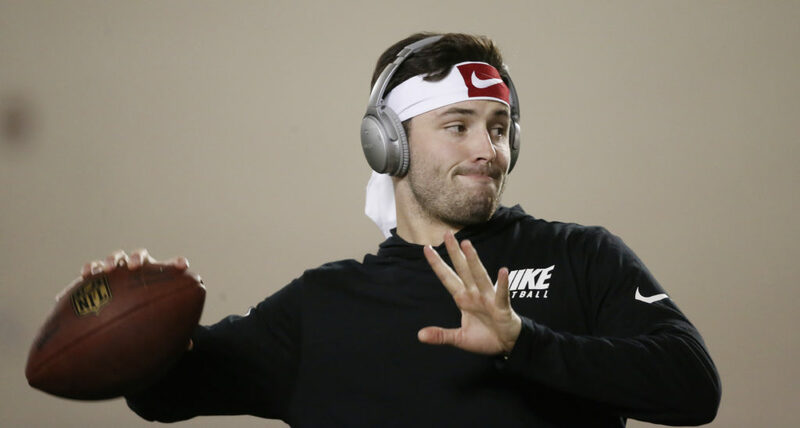 Arizona Cardinals: Baker Mayfield, QB, Oklahoma. Analysis: Mayfield could fall further than people think. He’s short, and got arrested a year ago. Still, the Cardinals probably wouldn’t pass on him at pick No. 15. They’re desperate for a quarterback, because their starter, Sam Bradford, has a glass jaw. Still reaching on Wynn at 14 I see… Horrible value at that draft slot. Landry would hold much more value at that spot. Based on history and talent observations. A runt of a Guard with short arms who looks more like a DT will never be drafted in the first round let alone the top 14. That’s if no one moves up but Green Bay Packers , possible yes . You really think they (QBS) go ,1,2,3,4, . ? Jeez, I thought that was you in the pic Grant. Doppleganger. Not bad Grant, but I have a feeling the draft order could look very different. The Jets are trying to trade up to the top pick of the draft, the Bills are wanting to trade up into the top ten (if not the top 5), and Ballard has indicated that the Colts want to trade down again. 5 or 6 would be a good spot to trade up for Nelson or Chubb if the Niners are interested. The Rams possibly getting Suh with Donald could make Nelson a priority. Landry at 14 is right where I have him graded. If the target is Wynn, I would look to trade down again. Trading up to five or six would be very expensive. Look how much the Jets had to trade to move up three spots. They would have to really like a guy to do that. Makes more sense to trade down for Wynn or Hernandez. Unless they want the sure thing in Nelson to put Donald and Suh on their backs. Not sure if Shanny would see him as a good fit though. Nelson is one of the rare 330 lbs OG who would fit Kyle’s scheme. However, like you said, I don’t see the 49ers paying a steep price to move up for a Guard. I agree it makes more sense to move back and draft Wynn or Hernandez or edge rusher. Though I could definitely see them standing pat and taking Nelson if they are lucky enough to have him fall to them at #9. Not likely 3 guards go in the first round as history shows us. Infact I guarantee it… Wynn is undersized with short arms. He is probably best suited to play center in the NFL. Nelson, Wynn and Hernandez all are better prospects than Mike Iupati, who was the 17th pick in 2010. That is not true at all and Iupati was the first guard off the board. Hernandez is very similar but Wynn is undersized and not a top prospect. In fact 2 of the 4 Guards taken this decade in the first round were drafted by the 49ers with Iupati and Garnett. None of them including Iupati are in the same league as Nelson. Nobody even mentioned Nelson because he is considered a top 5 talent. Nobody is arguing that. Its pretty self explanatory considering I didnt mention him. I never said he was wrong about Nelson just the other two. You said that’s not true at all. Implying that Grant’s comment wasn’t true. His comment included Nelson. If you didn’t mean to imply that, then fine. But it was your mistake, not mine. Ok bro, next time exercise common sense. Everyone in the free world has Nelson as a top 5 talent. We dont need you to point out the obvious. I wouldn’t have thought that if you hadn’t said “That is not true at all”. Yeah, they should know. But how do I know that you know that? I’ve seen you on here before, but not enough to know what you think about Nelson. Actually you wouldn’t have thought that if Grant didnt bring up Nelsons name for no reason. We all know he is getting drafted in the first round. Hernandez and Wynn not so much. Grant just trying to cloud the issues. Wynn and Hernandez would be lucky to get that many awards combined. Wynn and Hernandez are better prospects coming out of college than Iupati was. No question. Fair enough. I wasn’t trying to be a d-bag, just explaining why I made my comment. I should also mention that back when we still had the #2 pick, I advocated taking Nelson there. People said I was crazy. They said you don’t take a G that high. So I wasn’t sure if you were the type that tried to devalue the position as a whole. But anyway, I hope you post more often. We could use more voices. Actually I am in the camp of not drafting a Guard in the top 5. I think that should be reserved for skill positions. I could see Nelson sliding to us at 9 for this exact reason. Problem is I dont think he is an ideal fit for our ozb scheme. He is more of a mauler and road grader than he is a shifty/pulling guard that can consistently get out in front of the play. I love him as a player but I just dont see the fit for us. I wasnt trying to be a d-bag either bro. I enjoy posting and reading here. I like knowledgeable fans. Iupati was drafted at 17. Wynn or Hernandez wont be drafted till the end of the first and into the second round. Sorry but you are wrong and draft day will prove it! Iupati and Hernandez match for /Baalke-Harbaugh. Winn is a Shanny Guy., More than. a Baalke Guy. Agree 100% and all the more reason you dont draft Wynn high. He doesn’t fit the needs of most teams and he will fall into the second round most likely. Shanahan has already proven he is willing to overpay for the players he wants. Wouldn’t it have been more sense to wait a bit in FA and see if other centers were released? Instead they targeted a player that Shanahan wanted and went after him. Don’t expect the draft to be any different. He may want other players with the picks you’d have to trade the Jets to move up for Nelson. Just pointing out that going with the “sensible” choice isn’t necessarily what the team has shown to do under the new management. They’ve already shown to make bad calls over players they like in the draft, Thomas and Foster. Grant, it costs the Jets way above chart to move to three. That’s what happens near the top of the draft in a hot quarterback market. But once the quarterback situation settles down things go closer to chart. You can’t force the Colts of Bucs to trade, but if they are in a trade-back mood Chubbs or Nelson are within striking distance. If the 49ers are outbid by a quarterback hungry team, that’s good too. It pushes the coveted player even lower. True, they paid an enormous sum relative to almost any “value” table. They have to like 3 QBs for that to be worth it. Such a Jets move. The Giants must have loved that trade almost as much as Indy! How about you post the rest of the 1st Rd mock Grant? C’mon bud, we want more! I think the Giants will take Nelson after missing out on Norwell. They already have their starting guards — Erick Flowers and Patrick Omameh. Hey, I don’t know what Giants will do. Maybe Barkley, maybe trade out. But Flowers is a failed-Tackle conversion and Omameh is a traveling journeyman. Nelson would be a foundational pick. If I’m the Giants’ GM I’m going QB of the Future. Flowers and Omameh will be the starting guards. Any QB the Giants draft will have the same problem Eli Manning has — no running game. Too much of a burden on the QB to carry the offense. They can always draft a RB on Day 2 of the draft. There is plenty of depth at the position. Barkley is the best player in the draft. If the Giants don’t take him, the Jets could. Barkley could be who the Jets want though. All the more reason they tried to get Norwell and will most likely draft Nelson. They signed Omameh after missing on Norwell. And they’re paying Omameh to start. That really doesn’t rule the Giants out of taking Nelson though. It rules them out. They have bigger needs at running back and quarterback. The 49ers signed Kilgore to a three-year deal, then proceeded to sign Richburg. I don’t think the signing of Omameh rules them out. If that logic is followed, then Barkley is also out of the equation because they signed Stewart. I’m hearing Ward is shooting up the board, and the Bears would probably take him instead of Edmunds. I’d do the trade with the Packers but I’d take Landry if he’s still on the board. I think the 49ers would target an OT like Miller in the first round, rather than a OG that can play there in a pinch. If they go that route, I’d expect Brown to be traded sooner, rather than later…. Is that what you’re ‘hearing’??? Idiot. Nothing has changed my mine about taking an edge with the first pick. I am fully aware of the need to continue to upgrade the O-line, however I believe with the offense that is current today is going to put up lots of points causing the opposing teams to throw the ball to keep up. Hence, Sherman will need to be awesome and the Niners going to need a pass rush. The teams will be gunning for the Niners, they (the Niners) will surprise no one. I agree. Landry threatens the edge with the best first step, bend without slowing down, and speed. That will make the quarterback have to step up right into our interior pass force. He would be the missing piece to our front, given we don’t have anyone close to his skillset…. Sitting here about 40 miles east of Klamath Falls, Oregon, should be home tomorrow. Listening to some Humble Pie, and having a beer, (I very rarely drink), bowl in hand, trying to get caught up on all what’s happening in FA. Been thinking about taking in the Indy 500 next year, if so I will come up and see you…. That’d be awesome, Dave! You’re welcome anytime! Absolutely agree. Landry is the best speed rusher to come out in awhile. Let him play passing downs as a rookie while learning the intricacies of being a full time 4-3 outside backer. Have you made a mock yet where the 49ers actually pick at #9? There is no way Giants take Barkley.. i feel like NYG are leaning towards QB. Eli Manning is terrible. Pretty much surviving off his last name at this point. I think Barkley falls to the Colts at 6. Manning isn’t terrible. He needs a run game. Sherman won’t want his fate tied to an aging QB. They need to draft the second best QB in the draft. Honestly i could see new York trading back If they were going QB they probably could’ve moved manning, grabbed a Keenum/ Taylor bridge QB and then drafted their QB of the future. It just doesn’t feel like they want to go qb. I like the idea of trading down but It will take a lot more than a 3rd and a 4th to move up to 9 from 15 especially with the 9ers missing their own 2nd this year. I could see a 1st, 2nd, and a 4th or 5th with maybe a 6th or 7th thrown in from us. We will be at least looking for a 2nd round pick to move back out of the top 10. There simply is no reason to pass on a blue chip player this year unless serious value is gained. Plus if we move back it will probably to nabb Landry or Davenport. If we miss Nelson the next few guards bellow him are all similar in talent and one will be available in the 2nd especially If we acquire a 2nd in a trade back. Imo, the QB’s listed above will all go by the 5th pick, not necessarily in the order I selected.. Baker Mayfield likely the bubble guy of the four. I also think it’s likely the 49ers trade down, sure like another 2nd though. May depend on draft day if a QB is still there at #9 and if Buffalo or Miami still want/need one. I think the 49ers would trade up if they thought they could get Nelson or Chubb, but their availability is highly unlikely. We need to draft all defense. Our D is suspect. We can’t stop the run for our lives. Jimmy ward is garbage and Tartt is alright. Colbert is better than both of them. If Nelson isn’t there and Chubb is gone I would take Vita Vea. The middle of our d line is horrible. Who we have Buckner and mitchell? No way. We get Vea our run D instantly is upgraded and gives Foster a clear path to wreak havoc. Then we can get a pass rusher in the second. I would love it if josh Allen is still there at 9 so we can get the bills two first rounders. I keep hearing people mention getting the Bills two first round picks. Not going to happen, last week they traded up to 12. As first reported by Peter Schrager of NFL Network, the Bills traded Cordy Glenn, the No. 21 pick and pick No. 158 in the fifth-round to Buffalo in exchange for the No. 12 pick and pick No. 187 in the sixth-round. I hear ya, I wouldn’t mind Vea at 9 but it is a bit of a reach for that position. It’s not really that important and it’s hard to get a guy that not only can but is passionate about the craft of taking on double teams and absolutely battling in the trenches on every play. I think you are a year late on this complaint. Only 5 teams gave up fewer yards per carry than the niners who allowed only 3.8 yards per carry on average. Their pass defense in contrast allowed 6.6 yards per attempt, 8th worst in the NFL. Interesting point, I thought I heard a stat the other day that said the 49ers pass defense was top 10 in the league? Rich Madrid is having a really fun time breaking down McKinnon’s film from last year. Really shows why Shanahan likes him. Thanks for pointing this out, SMcG. He and Breida have a lot in common and will make a dynamic duo. Grant, I see you agree that Wynn can play any position along the OL. I get that his height would typically suggest a move to the inside, but I really think he has the required athleticism to stay at OT in the NFL. If the 49ers do draft him I expect he would play OG to start, but could easily end up at RT in 2019 and potentially LT down the road. Arms are too short to play tackle in the NFL. Only in a pinch would he play tackle at the next level. I see him kicking inside and center might be his best pro position. His arm length is on the threshold. Not ideal, but not insufficient to play OT in the right system. I think like Derrick Deese he can be quite a capable OT in the NFL despite less than ideal size. Good mock. But after seeing what the Jets had to give up to go up 3 spots, we would get more value than what you posted, from Green bay. I be dancing in in the streets if this happened! The mock makes sense. Wynn makes sense. The trade makes sense in practice and according to charts. Lying season lasts at least from the combine until the October trade deadline. But my take is Lynch thinks this will be the last time the 49ers will be drafting at 9 in a long, long time. He wants a unique talent at a key position. I think they’d trade up for a player Lynch loves. Expensive, but close to chart as long as your not competing with a team looking for a quarterback. You can’t force the Colts of Bucs to trade, but if they are in a trade-back mood Chubbs or Nelson could be well within striking distance. And if the 49ers are outbid by a quarterback hungry team, that’s good too. It pushes the coveted player even lower. Good post I agree… That description says Harold Landry to me. This is going to be a very intriguing draft. The first key is the Giants and the Bills. Will one trade down and the other up. The giants have a lot of holes and would best be served to trade back and get more picks. They could go Barkley or they could go QB or even OL. With that said, Denver is not going with Nelson. They need to replace Talib. if they are not going QB or get someone on to man up on either of the DE position. So I see Chubbs or Ward. I also don’t see the Raiders going DB even if Ward drops to them. Smith is the pick. I also don’t see Miami going with Smith. They need a QB, I see them taking a QB, maybe even moving up to the niners spot if one is available that they like to prevent the Cards from getting him. If we do trade back it certainly isn’t going to be for the #2 rated guard at 14. That is to high for him and it has nothing to do with where Iupati was picked, different FO and different scheme-he is a scheme fit, but not BPA at #14 or value. Anyone that is interested in getting to know Harold Landry’s game a bit better I recommend looking up Voch Lombardi’s recent profile on him on youtube. Its about 30 mins and Lombardi is a bit over the top, but he does a good job of highlighting how Landry’s strengths as a pass rusher go beyond just his athleticism, but rather demonstrate a player that understands technique, has good football acumen and understands the game, and knows how to work an OT. Also does a good job debunking a few myths about some ‘weaknesses’ in Landry’s game. Ive seen several of his tapes, but have yet to see his breakdown of Landry. Will definitely give it a view… I feel he is a better evaluator of trench players than than skill position players. So he should be a decent evaluator of Landry. That is a good one for sure. It’s always good to get different perspectives along with watching the videos on Draft Breakdown. What I like most about Landry is he is doing it all on natural ability right now. He doesn’t know how to use his hands which he will be coached up on, along with adding some muscle to his frame to hold up better against pulling OG’s. He has amazing balance which allows him to be literally 3 feet off the ground in his bend and still maintain leverage. He’s also able to quickly decipher play action which you rarely see from young NFL players, never mind a kid in College. He just has so much natural football instinct and ability, I’m excited to see what he can become with NFL coaching. I can’t believe how many are missing the boat on this kid. He wouldn’t even be available at #9 if he hadn’t been injured and played through it. He could become a dominant pass rusher along the lines of Von Miller if he takes to the coaching on technique he’ll receive. I’m not saying he will be Von Miller, just that the talent is there to reach those kind of heights if he can develop a little more strength and a secondary pass rush move. He’s like an edge limbo rusher that doesn’t need to slow down around the arc. Best I’ve seen in quite some time. Yeah, a lot to like about Landry. Like you, I am surprised how little attention he is getting. Clearly the #1 pass rush prospect in this draft for mine. Lombardi does a good job of demonstrating how a lot of those negatives you mentioned, which are the negatives you commonly see repeated in profiles, are way overblown. He shows the ability to convert speed to power. He shows excellent hand fighting and placement. He shows good ability to disengage. He shows secondary moves, just not the typical swim or spin moves people expect to see as secondary moves. He shows he can hold the point of attack and has adequate strength (and will only get stronger in the NFL). He is a nuanced and technically skilled edge player that excels as a speed rusher. I’m nitpicking and speculating on what he will likely need to improve on at the next level. The only negative I see, and it’s not really a negative, more like something he needs to develop, are his hands. He is doing well with some pretty basic hand movement imo. I think NFL tackles will catch on to his grab and pull pretty quickly. He’s going to learn how to manipulate with his hands more effectively and also incorporate more chop action with NFL Coaching. As far as needing to develop moves, he is great at dipping the shoulder, but needs to develop a swim/rip action he can go to along with an initial punch that can shock some of the NFL OT’s he won’t be able to beat around the edge. His ability to set the edge is underrated as Voch pointed out. I agree with you that he has adequate strength and can disengage from a lot of College OT’s, but most of his success is based on his natural ability from what I see. As Lombardi pointed out, he always has a plan. When he gets into an NFL system and learns proper technique and how to set people up, he is going to be a wrecking ball. He has so much natural talent and instinct already. He is going to be a special player when he develops the other areas a little more. Love reading the comments here. Been following this page a while. Grant, I like that you’re willing to be critical instead of just being a fanboy. Although, you sometimes come off as an eternal pessimist. As for your mock. I can see them trading back, but agree with some of the others that Wynn is a reach here. Landry offers more value for the pick. There’s really no debate that it’s harder to find a pass rusher than a guard. The top three guards in this draft are better than the best offensive-tackle prospects. I’m not sure people realize that. i can see the 49ers trading back……..if Chubb, Nelson AND Fitzpatrick are all gone! I was with you as far as Fitz not being coveted by the 49ers…………for the simple reason that safety isn’t a pressing need. But the more thought I put into it…… the more sense he makes. one reason I was I favor of the Sherman singing is that, out of Ward and Jackson, the top 2 cb prospects……they don’t have the ideal size we covet. Butler didn’t either. Leaving only the other top FA in Trumain Johnson as a good fit. I figured the price for him to be $16 mil a year at 4-6 years. Sherman’s deal is better for the team. Sherman is more accomplished. Hell bring some swag and leadership that will be greater than whatever TJ would have brought…..
but we still need a cb for the future, and depth…..and if Grant is to be believed…..one to replace Sherman as he washes out of the league before our by week! So why MF has widely been regarded as the best db in the draft…..most project him as a safety. but why not draft him and groom him to play cb??? get the best 4 -5 db’s on the field in the same way you would get the best 5 o-linemen on. Someone might have to play “out of position” for a while…..
ward and Tart have not proven to stay healthy and both will be FA’s soon as well….. So a guy that instantly bumps his way into the starting line-up will bump someone into the “depth” category…..
Would be helpful for slot CB depth and special teams — the latter could also benefit from improved depth. That’s probably it, Mood. It’s also possible they think he can play high safety and back up Ward. I have no idea if he can of if they think he can. Colbert, Ward’s backup, can also play outside corner and fits their mold pretty well. Maybe they would rather groom him at CB instead of someone they are likely to want or be able to draft this year. Just a wild guess, maybe too wild. He would be a very good depth signing. Can play anywhere in the secondary. Interesting early mock…but how would the mock look if the 9ers panic–as they are very prone to do? Or if Lynch stumbles and Shanny bumbles, or they both work together on a botched draft operation? You are the most paranoid person on this blog when it comes to injured NFL players, especially players coming off surgeries. So why would you select Isaiah Wynn with the 14th pick in the 1st round? Wynn tore his labrum in his left shoulder during Senior Bowl PRACTICE and he didn’t even play in the game. I haven’t heard that Wynn’s surgery didn’t take like with Reuben Foster’s didn’t take. Did I miss something? Call the family physician and find out…You overreact to every injury year after year, more than any sports journalist I’ve ever seen. If you’re not a fan of a particular player it’s like “he’s damaged goods”… injury-prone. Which injury did I overreact to? I’m getting brakes put on my car right now by some mechanics that look more like librarians..I’m not going to dive into the archives at this moment. But it’s an awful lot of players. I like Isaiah Wynn a lot but not inside the top 20. Put up a new poll asking if you overreact to injuries then we’ll find out if I’m right or wrong. All depends on how Grant and the rest of us view the term ‘overreaction’. Grant will deftly place himself in the grey area–able to defend against any challenge. Would love to have the 9ers select Hernandez (OG) somewhere in the draft. Hernandez or Wynn would be great picks at No. 14. If they go OL in the first round outside of the top 10, it will be for a true OT by the name of Kolton Miller. All 32 teams were repped at @UCLAFootball pro day, including HCs from CIN, SD, NO; GMs from ATL, NYJ; and NYJ OC Jeremy Bates. An afterthought after disastrous 2017 debut vs. Texas A&M, OT Kolton Miller now looks locked for middle of Round 1. Carbon copy of Nate Solder. Fits the zone-blocking scheme, but will have problems in pass protection. If they do take Miller, I’d expect Brown to be traded. Is that how you see it, Grant? No question. And they may want to trade Brown. But I think the three guards are better than Miller. What do you think? I wasn’t a fan of Miller, but I understand why he’s moving up the draft board and why Shanny seems interested. I think Miller is the more valuable piece to Shanny, given his explosive lower body and size, because he could start out at RT and groomed to take over for Staley. I get the sense that, although those guards may be better right now at their position, Shanny doesn’t value it in his offense like he does OT, coupled with the need on an expiring Staley, poor fit of Brown and perhaps disenchantment, I feel a player like Miller would make a lot of sense from their perspective…. I’m surprised that Connor Williams isn’t mentioned much. He fits. He can fill an immediate need at G. He could play T if we decide to move on from Brown. Agreed #80. Williams or Wynn would be good picks imo. I’m not a fan of Miller. I think the testing is getting people excited more than the play on the field. As a UCLA alumni, and avid UCLA football watcher, I agree with Rocket: Kolton Miller is not worth a first round pick. I am hoping some team other than the Niners makes the mistake of drafting him that high. If you want a tackle, both McGlinchey and Connor Williams are much better. I disagree with, Rocket because the testing has little influence on the scouts who already had 90% of their evaluations done prior to the combine…. I was referring more to the fans and sites than NFL scouts. He’s getting a lot of attention for visits, but I’m not convinced that automatically translates into a first round pick. I wouldn’t take him in the first even with a trade down. Did you see Brandt’s tweet I posted above? I’m certainly not going to question Gil’s credentials, but I recall CFC feeling that he doesn’t have it anymore. Gil has an incredible encyclopedic memory of players. He’s a treasure. I just don’t agree with the assessment. Miller wasn’t good and I’d be surprised if he gets into the first. Just this hacks opinion of course. Doesn’t mean much compared to the NFL insiders. Yea, I imagine Gil rubs shoulders with the higher echelon. Yep, as I stated above, I’m not a fan, however he was protecting for a statue, and he’s got a very explosive base for such a big man. Seems like a perfect fit schematically, and Shanny seems interested. It may mean they’re looking for a pure OT in round 1 rather than an OG that can play one in a pinch. I dunno…. Stupid Nargles, this post was meant for Pot, below. Razoreater: Have you watched the tape on Kolton Miller? Tell me what you are seeing that I am missing. Is it just my frustration with UCLA’s offensive line (and it’s inability to run block or protect Rosen), or do you see a lot of missed reads or blocks from Miller that I tend to recall? Same. He is an interesting mid round prospect that is currently being talked of as a 1st rounder. Grant, will you be at Levi’s for the Sherman presser? Cool. Can you ask him if Lynch has picked his brain regarding any cornerbacks in the upcoming draft? I would be very surprised if a team that either has no franchise QB or has one older than 37-38, and is drafting in the top 10 will not draft a high-slotted QB. So I cannot see Giants and the Broncos not drafting QBs. Even though Mayfield is not a top-10 pick by old-school value book, I think he will go in the top-10 just because of positional value. Agree except for the Broncos. Keenum is only 30. I think you could make a plausible argument that Keenum is as much of a risk for the Broncos as Jimmy G. is for the 49ers. Neither have a long-term history of success. One has a long term history of failure, and journeyman. I got the impression that Keenum needs good players around him and a specific offensive system to succeed, much like Foles. I don’t consider either to be franchise QB caliber based on their extensive bodies of work. Ignoring the opportunity to take advantage of top-10 draft position and have a good chance at filling the position of a 10-years franchise QB can be a devastating blow to a franchise. No team wants to draft regularly in the top-10 (except the Browns), and the NFL is set-up to discourage that situation. The fact that a team like Giants or Broncos would draft at any other position is pretty unthinkable to me strictly from common sense. But then, what the heck do I know about football? Keenum had a nice run with the Vikings but he’s a journeyman caliber QB who played well within the system and relied on a strong running game and defense. I would be surprised if the Broncos pass on a QB, especially considering they only signed Keenum short term. Paxton Lynch hasn’t come close to providing any glimpse of being an NFL QB never mind a starter, so they are in need big time. I think the Giants should take a QB too, but I have a feeling they won’t based on believing they can get a few more years out of Eli if they can improve the Oline and running game. I think they will try to trade down and if so take an OL. They could even stay where they are and take Nelson. Although that would be high for the position, he is a top 5 player and can play anywhere on the line in a pinch. What do you think about, Tony Adams, OG, North Carolina State as a day 3 prospect, Rocket? I like him. Really wide lower body and moves well for a guy his size. Doesn’t hurt that he already knows the OZ, but needs to play a little lower in pass pro imo. Good prospect for day 3 definitely. That’s pretty good. One of his profiles compared him to Sitton which is pretty good too. noticed you were flip flopping on the same premise on another argument you were having the other day……if i cared I would have jumped in…..
“Holy smokes the deal is even bigger than first reported. That is a lot for a guy with his level of production so far. Looks like a major overpay right now. Hope he is what they think he is. The problem I have with it is it continues a propensity of this regime to overpay for what the position/history dictates. As Grant pointed out, he’s now the 4th highest paid RB in the league and he’s been a part time player with a YPA under 4. Sure it’s not our money, but the extra money spent on McKinnon could have been used somewhere else. There is also the fact that RB is the easiest position to find in the draft which is why there is normally not much of a FA market for them. As I said, I hope he is what they are paying him to be, but he certainly hasn’t put up the numbers to state that case.
. Even if McKinnon does well, they are paying him near the top of the pay scale already. That’s why I’m not a fan of the contract. No need for you to jump in unless you know the facts, which you usually don’t. I was pretty clear in my opinion: I’m ok with the player; don’t like the contract. They could have gotten Crowell for less money, but at the end of the day Shanny wanted McKinnon and he got him. Can’t argue with that. Matt Stafford hasn’t won a playoff game either. Neither has Garoppolo for that matter. Cousins is being paid like a top ten QB which he has played like since he took over as the starter. Wins are not a QB stat. They are a team stat. You still haven’t been able to figure that out for some reason. People also seem to forget the Giants took a guy they hope will be their QB of the future last year in Davis Webb. Yeah I didn’t forget, I just don’t think he’s that good. They didn’t put him on the field at all last year so the jury is out. I’d like to see the team sign Jaylen Watkins. I was a fan of his in the 2014 draft. Hasn’t quite panned out so far but I think he’s worth giving another shot. If nothing else could be solid depth. 2. Bills (trade with Giants): QB Josh Rosen, UCLA. I think Buffalo will have to give up a ransom (both first round picks this year, a second rounder in 2018, a third rounder in 2018, and a first rounder next year). 9. Niners: EDGE Harold Landry, Boston College (bigger drop-off from Landry to the next Edge rusher, then at guard. In the second round, we take whoever remains among James Daniels, Billy Price, and Austin Corbett, and I think it will be Corbett left). 10. Raiders: CB Denzel Ward, Ohio State. I think the Raiders resign NaVorro Bowman to relieve them not taking Smith or Edmunds. Is that because they are so deep at those positions??? Joe Thomas has a great sense of humor. He pulled Shanny into his retirement speech, too. Lot of players I wanted were drafted right before my pick. Welp, Sherman was dressed like he went down to Georgia, looking for a soul to steal but he did give some interesting insight into some of the behind the scene negotiations/wining and dining…. Thanks Rocket, it was a good read, loved the part where he mentioned discussing schemes for hours with shannahan. People lump Coach has an offensive mind but he has a great footballl mind. I believe the team is in good hands! Yes, definitely a good read. I will be interested in watching his future endeavors once he leaves football. He shows a level of intelligence grounded in reality (ie. not having his head in the clouds). I expect that he will make a name for himself in whichever field he chooses after football. I think somebody – may have been Scooter – brought him up a couple of days ago. I like it. We needed another vet signed and this is no risk with some real potential. I don’t know anything about Cooper, but according to PFT he had knee surgery earlier this offseason. It’s got me thinking about how most of us railed against Baalke for bringing in injured players and draft picks. It seems as though JL is not averse to that strategy, at least for injured free agents. He hasn’t done it with draft picks yet, and perhaps that is a key difference. It’s also probably unrealistic to think that we can bring in free agents who are injury free – considering we’re talking about football. MF: I haven’t been 100% since after my first NFL game. Yeah that is a key difference Cubus. When you sign a FA with an injury, there is no guaranteed money and you aren’t signing the player at the expense of another. For every injured player Baalke drafted, he left somebody on the board who may have helped the team, although with his record, they likely wouldn’t have worked out regardless. I see what you’re saying, Rocket, but I don’t think it’s quite as black and white as you describe. Sherman has guaranteed money as does Richburg. There’s always some risk, it’s primarily the degree of mitigation. With regards to drafting, you do leave others on the board, but there’s no history of NFL performance. Did you consider the injured players that Baalke drafted a good value at the time he drafted (but don’t include the benefit of hindsight). Carradine for example. The guaranteed money is up front for most of these deals and won’t bleed into ensuing years, so the risk is mitigated somewhat. Carradine I wasn’t upset with because all reports were that he’d be back pretty quickly and he had been a very good pass rusher at FSU, and I didn’t mind when Baalke took a flyer on somebody late in the draft where it’s a toss up at the best of times, but taking Will Redmond in round 3 was a really poor pick as was Smelter in the 4th who not only was coming back from injury, but hadn’t even played in a passing offense before getting hurt. Marcus Lattimore after his gruesome injury? You make picks like this late in the draft not in the middle of it. Yeah, Carradine is the one good flyer I thought that Baalke took. But they couldn’t seem to figure out how he would fit. I really had the impression that Saleh was very high on Carradine, so I guess I’m a bit surprised he wasn’t re-signed. That’s a really smart signing imo. Cooper started 13 games with the Cowboys in 2017 after being picked up late 2016 for playoff depth. Do you know if he won the starting job in 2017 or was it thrust upon him as a result of injury? He won it after Chaz Green was awful the first 3 games. Do you know why the Cowboys let him hit free agency? Soooo, Jonathan Cooper signed. Brought in to compete for starting guard position. 49ers sign a Guard who will compete for a starting position. Other then Nelson falling to 9( Ain’t happening not getting passed the Bears) the signing of Cooper means they will not take a guard in Rnd 1. There targets are 1. Edmunds 2. Sutton( trade down) 3. Landry( Edmunds off the board) 4. James( If they trade Ward which I don’t see). I’m pretty confident Edmunds would be the pick. My dark horse is Sutton. His times where very impressive for his size. I think that caught the Niners eye. Do you think Attachou is sufficient as an edge rusher or do you anticipate they will draft an edge rusher later? I’m thinking the first pick will be Landry. It just seems that next to franchise QB, franchise edge rusher is the most difficult position to find. Few are let go in free agency. Sounds good but we need linebackers. Foster is going down thevpath of aldon smith. A coupke of big cbs and back up ol and lets go!